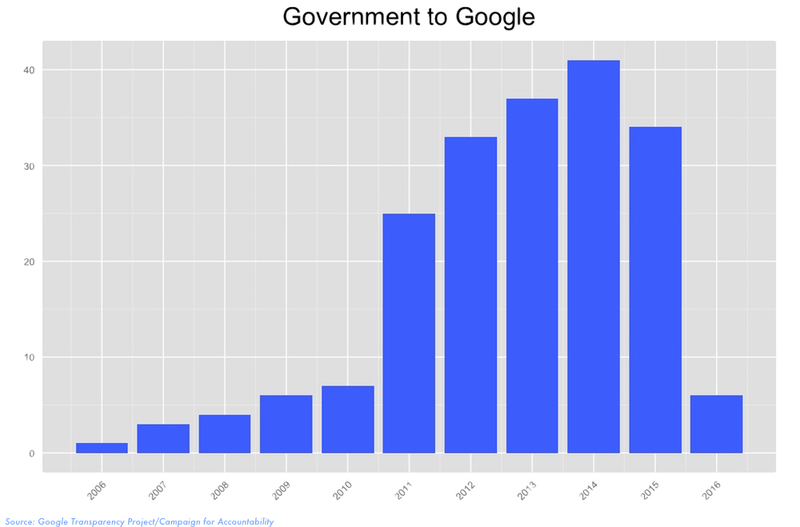 The Google Transparency Project has so fari identified 258 instances of “revolving door” activity (involving 251 individuals) between Googleii or related firms, and the federal government, national political campaigns and Congress during President Obama’s time in office. 53 revolving door moves between Google and the White House. Those involved 22 former White House officials who left the administration to work for Google, and 31 Google executives (or from Google’s main outside firms) who joined the White House, or were appointed to federal advisory boards. 28 revolving door moves between Google and government positions involving national security, intelligence or the Department of Defense. Seven former national security and intelligence officials and 18 Pentagon officials moved to Google; while three Google executives moved to DoD. 23 revolving door moves between Google and the State Department during the Obama administration. Eighteen former State Department officials joined Google, while five Google officials took up senior posts at the State Department. 9 moves between Google and its outside lobbying firms and the Federal Communications Commission, which handles a growing number of regulatory matters with a major impact on the company’s bottom line. Google has hired from throughout the top echelons of the policymaking world in Washington, including high-level White House officials. It also enjoys the benefit of having former executives moving into top positions in the administration that set policy on issues crucial to the company. Those include the Chief Technology Officer, a former Google executive, and key slots at the Office of Science and Technology Policy (OSTP). Former Googlers also occupy key positions at the National Economic Council and the U.S. Digital Service, a part of the Executive Office of the President. The company has strategically hired from government agencies that have the greatest impact on its business, like the Federal Communications Commission and Federal Trade Commission. Google, or its main law firms, have hired several people from the Federal Trade Commission, an agency that has conducted investigations into the company’s conduct on privacy and antitrust grounds. Google’s hiring of government officials gives it valuable insight into the inner workings of government and politics. Having former Googlers steeped in its culture inside the government also gives it a formidable conduit to influence policymaking on a variety of issues affecting its interests. 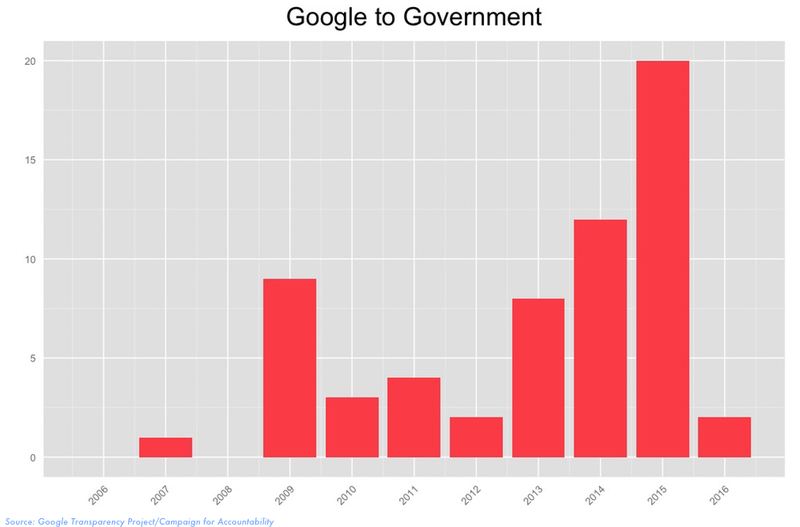 The following breakdown illustrates the size and breadth of the traffic between Google and the U.S. government. Senior Google executives have been appointed to several key federal advisory boards during Obama’s two terms including; Eric Schmidt and Google’s artificial intelligence chief Adrian Aoun (President’s Council of Advisors on Science and Technology); Google Evangelist Vint Cerf (National Science Board); and Google board member John Doerr (President’s Council on Jobs and Competitiveness and President’s Economic Board). 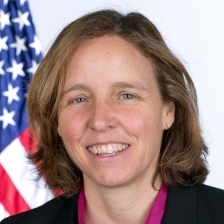 Several former Google executives also left the company to head up key White House positions on science and technology policy including Megan Smith (CTO); Amy Luers (Asst. Director Office of Science & Technology Policy); Alex Macgillivray (Deputy CTO); Nicole Wong (Deputy CTO); Janine Versi (National Economic Council); and Andrew McLaughlin (Deputy CTO). Several senior White House officials involved in national security and cybersecurity issues have joined Google since 2008. Deputy National Security Advisor Caroline Atkinson joined the company in early 2016 as its new head of global public policy. Others include Chris Finan (White House Director for Cybersecurity Legislation); Cybersecurity Director Sameer Bhalotra; and NSC Cybersecurity Director Will Hudson. DARPA’s senior director Regina Dugan joined Google in 2012 to head the company’s advanced technology and products division. Michele Weslander Quaid who served in senior positions at the Department of Defense, National Geospatial Intelligence Agency and the National Reconnaissance Office joined Google in 2015 as the company’s “Chief Innovation Evangelist”. Other moves include DARPA’s Jeffrey Rogers (Google Director of Engineering, Healthcare Technologies); DARPA’s Paul Eremko (Google Director of Engineering Advanced Technologies); CIA weapons analyst Nicole Menkhoff (Google HR); and CIA Technical Operations Officer Justin Schuh (Google InfoSec engineer). One of the underreported stories emerging from Google’s close relationship with the Obama administration is the company’s deep involvement in foreign policy issues. 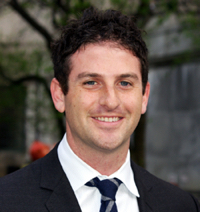 Jared Cohen, who worked at the State Department under Hillary Clinton and who later joined Google as the head of Google Ideas (now called Jigsaw), helped draft the State Department’s “21-st Century Statecraft” Initiative, which called for using Internet and social media technologies to pursue diplomatic goals. Eric Schmidt joined Secretary Clinton and other tech executives in 2010 at a dinner arranged by Cohen to discuss the use of technology for diplomatic purposes. Schmidt and Cohen have participated in officially sanctioned delegation visits to Iraq and other countries, as well as unofficial visits to countries like North Korea. The two have co-authored The New Digital Age,v an exploration of social media to further U.S. foreign policy interests. Scott Carpenter, a former State Department deputy assistant secretary and Kate Krontiris, a State Department advisor on innovation and technology joined Google Ideas in 2011. Vijay Padmanabhan (attorney); Sage Moon (Diplomat & policy analyst); and Michiel Perry (policy analyst) are other State Department officials who have joined Google. Ann Mei Chang, who led Google’s global product development for emerging markets joined USAID in 2013.vii Chang heads USAID’s Alliance for an Affordable Internet (A4AI), a public-private partnership to bring the other two-thirds of the world’s population online. Google is one of three global sponsors of the A4AI initiative along with USAID and the U.K.’s Department for International Development.viii The company has contributed over $1 million to the program. Google has recruited top-level talent from the Federal Trade Commission, apparently in response to the FTC’s 2011 antitrust investigation into the company and ongoing investigations over antitrust issues related to Android and privacy matters. The company has hired several senior FTC attorneys and staffers directly while others have left government employment for Google’s top outside law firms. 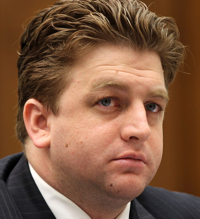 Robert Mahini: A former attorney in the FTC’s Office of General Counsel, Mahini left the Commission at the height of the FTC’s antitrust investigation in late 2012 to serve as Google’s senior policy counsel. Suzanne Michel: Former FTC counsel for intellectual property, Michel joined Google in 2011 as senior patent counsel. Google’s business interests in telecommunications policy have spanned a range of key issues during Obama’s term in office. Google lobbyists have been frequent visitors at the Commission, seeking to gain an advantage in a range of rulings that affect its business, such as net neutrality, “white spaces”, privacy issues, spectrum reform, municipal broadband and the FCC’s current set-top box rulemaking. Revolving door data shows six former FCC officials have joined Google’s payroll or that of its principal law firms during Obama’s time in office. Three others moved from Google to the FCC. While Google’s top lobbyist Johanna Shelton joined Google prior to Obama taking office, she served as an FCC attorney from 1998 to 2001. 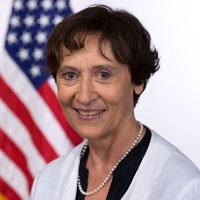 Renata Hesse, the Justice Department’s deputy assistant attorney general for antitrust, served as Google’s outside counsel at Wilson Sonsini before joining the FCC in 2011 as senior counsel for transactions. Google’s former lawyer in several antitrust matters, Hesse is tipped to become the Justice Department’s top antitrust official, replacing Bill Baer. Chanelle Hardy Reed who served as Commissioner Mignon Clyburn’s chief of staff, left the FCC this past December to do strategic outreach for Google. FCC Legal Advisor Austin Schlick joined Google in 2012 to serve as the company’s head of communications law. 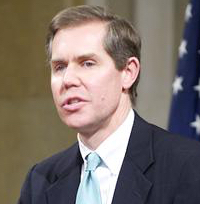 Colin Crowell, senior counsel to former FCC Chairman Julius Genachowski represented Google through his lobbying firm Crowell Strategies beginning in 2010. The Google Transparency Project has compiled a database of every revolving door move it could find between Google employees and White House officials. We invite the public to explore the data and suggest stories for the GTP and interested journalists and researchers to pursue.